When necessity, or nature, calls, Doodie Pack is the answer! Doodie Pack, LLC was founded by Kristin Elliott in the fall of 2008 with pure entrepreneurial intention. Letting research and good instinct rule decision-making towards a final product, Kristin’s appeal has been in the collaborative artistic, technical, and business process in getting Doodie Pack to the National marketplace. 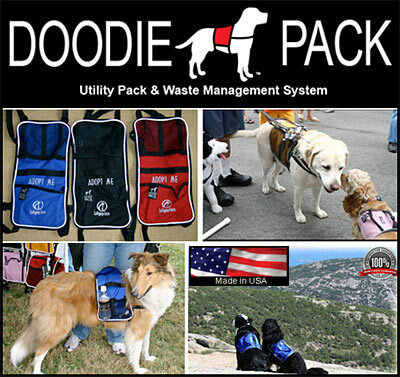 Within a rigorous framework of high quality and standards for customer service and safety, Doodie Pack, LLC, has been, and continues to be, committed to delivering an American –made product that was originally designed to improve the task of a responsible pet owner in managing waste on a walk. Along the way, Doodie Pack has evolved into a product, humbly recognized by a wide range of media outlets, as having a social and environmental conscience. Embroidered Doodie Packs have raised awareness for a wide variety of not-for profit agencies: from dog rescue and adoption groups, to pink ribbon’ed packs for breast cancer, to sneakers making strides for Juvenile Diabetes. Packs have been personalized and used for corporate sponsorship. In another use outside of its original intention, Doodie Packs have been endorsed by veterinarians and dog behaviorialists as the “perfect fit” for training and supporting good pet health. Doodie Packs provide a means for dogs to “have a job” and to increase their overall mental health and physical wellness. Doodie Packs have been built with durability to carry a variety of items, from sanitation bags to essentials such as water, keys, and identification with each pack featuring a perimeter of safety reflective tape. We listened to the suggestions of clients and in 2009 introduced our small Doodie Pack and additional colors to the original product line. Doodie Packs continue to gain a broad appeal and national audience as it improves the life quality and relationship between dog and owner. Doodie Pack is a canine utility backpack of rugged Cordura nylon designed to carry empty and waste-filled bags and other essentials during your dog walk. Doodie Pack’s roomy pockets allow your dog to comfortably carry whatever you put in the pack up to the recommended 25% of your dog’s body weight, as endorsed by veterinarians. Available in 8 colors and 3 sizes, each with adjustable straps and quick release buckles, Doodie Pack fits dogs from 8 to 180 lbs. Doodie Packs can be personalized with your dog’s name, organization, or company logo. Why Should I Involve My Dog With His Own Poo Management? Studies have shown that 20% of groundwater contamination comes directly from pet waste. Owners are increasingly conscious of the importance of picking up their pet’s waste, but the discomfort and aversion to having to carry the waste bag prevents many from doing so. Doodie Pack provides a reliable and dignified means to carrying waste until proper disposal is available. Doodie Pack is a natural segway between necessity and intention. What Other Items Can Doodie Pack Hold? Doodie Pack’s simple saddle bag design features deep pockets on both sides, with many colors featuring Velcro closures. A spilt mesh pocket on one side is perfect for holding water bottles, empty sanitation bags and personal items. An integrated clip secures keys in place, keeping hands free. The solid pocket is roomy and pleated, large enough to hold lightweight rain gear, snacks, a first-aid kit, and cooling and warming packs depending on current weather conditions. How Can Doodie Pack Actually Help To Calm My Dog? Veterinarians and trainers have stated for years that a way to calm dogs is through daily routine and exercise. Working class dogs, such as Shepherds, Labs, and Border Collies, need a great deal of exercise and focused activity to help to expend their considerable energy reserves. Smaller dogs can exhibit similar high energy traits. Strapping on a Doodie Pack can be easily integrated into your daily outing ritual and asserts that you are in the leadership role. Wearing their Doodie Pack is the cue that you are heading out and focuses dogs on their job. Many therapy dogs wear a pack or vest just for this reason. Regular exercise, with a little added weight to the pack, can work wonders not only for your dog's health but also for his high strung disposition. Dogs, like children, take comfort being wrapped in what makes them secure, and useful. How Can Doodie Pack Also Work As A Safety Vest? Every Doodie Pack is constructed with a perimeter of high quality 3-M Brand reflective safety tape, similarly used by L.L. Bean in the construction of their kid back packs and cargo gear. It has been tested to hold up through multiple washings and it is sewn directly into the seam of the pack rather than as surface taping, as is the case of lesser constructed products. In addition to the built-in safety feature, Doodie Pack is offered in regulation (blaze) orange. This government rated orange is the same used in the construction of safety vests for the Department of Transportation, EMT and police responders, and hunting associations. Dogs wearing Doodie Packs in blaze orange are highly visible at dawn and dusk outings, especially in wooded environments. Every Doodie Pack is manufactured domestically using a breathable, durable, Cordura nylon with a light water repellant coating. Recommended to be surface cleaned as needed, Doodie Packs are washable and will hold up to being immersed in water. It is recommended that Doodie Packs be air dried and not be put into the dryer under intense heat. What Do Dog Owners Say About Their Doodie Packs? We have a 9-year-old Brittany who developed severe behavioral problems. A trainer suggested we use the Doodie Pack as part of a retraining program. The Doodie Pack gives her a sense of “working” as we added a very small amount of weight to the side pockets. The change in her leash walking has been a 100% improvement. She is always eager to put it on and ready for a walk! Just wanted to say that I love the Doodie Pack I purchased for my dog Quincy. I was visiting my sister in Penfield, NY at the end of May, during Canal Days, and that is when I bought this great product. I was concerned about the fit but no problem, it fits great and my dog loves wearing it. I am very happy with it- Thank You! I really like the way your pack has a wide cross section across the shoulders to distribute any weight and the chest strap to keep the weight more up on the shoulders and not on the actual back. Order Your Doodie Pack Today!